Corner cube prisms (or retroreflectors) used with electronic distance measuring (EDM) instruments have an offset due to the fact that the transmitted light beam from the EDM takes longer to enter and exit the prism. This longer time translates to a longer distance measured. This distance is corrected by using an "offset" and/or positioning the prism in relationship to the plumb line of the prism holder. The offset is determined by multiplying the height of the prism by the refractive index of the glass used. Common offsets are 0, -17.5 mm, -30 mm, -34 mm, and -40 mm. A nodal offset on a surveying prism is defined by the relationship of the prism holder and prism that places the optical center of the prism on the plumb line of the holder. This offset is the most advantageous at close range work when the apex or center of the prism is used as a pointing target for vertical and horizontal angle measurement. Every surveying prism has a nodal offset. Surveying Prisms and holders that are not in the nodal position however, can cause angular errors when using the prism apex as a target if it is not perfectly pointed toward the measuring instrument. To reduce pointing errors, several SECO prism assemblies are designed with a nodal point alignment at -17.5 (for 25-mm prisms) or -40 mm offset (for 62-mm prisms). See illustration at right. Commonly, the best reading of the beam is achieved when the prism face is perpendicular to the incoming beam for a parallel return. Unfortunately, ideal alignment is not always achieved in the field. 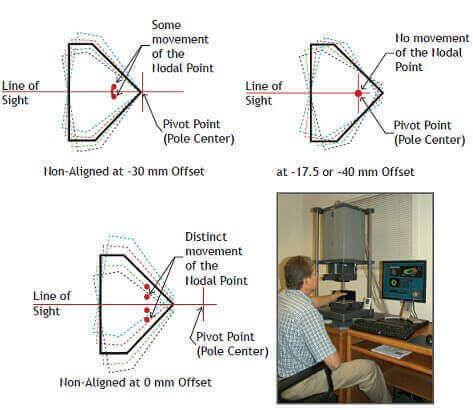 To compensate for pointing errors, nodal point alignment minimizes the error associated with misalignments (two illustrations below). Corner cube prisms redirect the measuring beam back to the EDM for signal processing. There are two main factors for good range measurement: prism diameter and beam deviation. If the beam deviation is not accurate enough, the returned beam will miss the EDM entirely. This occurs mainly near the maximum range of the EDM (check with your manufacturer). SECO standard prisms are <5 seconds. Higher accuracy prisms are also available. Surveying Prism accuracy is determined by the physical location of the prism in its canister and then to its holder. SECO brand prisms have an accuracy is 1 mm or less. EngineerSupply is an Authorized SECO Prism Dealer. SECO uses a ZYGO GPI-XP/D interferometer to test and confirm the beam deviation of prisms to ensure that they meet specifications. Certificates of compliance for Surveying Prisms are available upon request.